Episode 046: Catching up with the man of the hour, Troy Williams, Jr. In this episode, Troy Williams, Jr. joins the show to discuss his incredible week… Troy clinched the IHRA Top Dragster World Championship on Sunday, then kicked off the Fall Fling with a win in the 32-car Dragster Shootout. As if that weren’t enough, he capped the week with a $50,000 triumph in Friday’s main event! 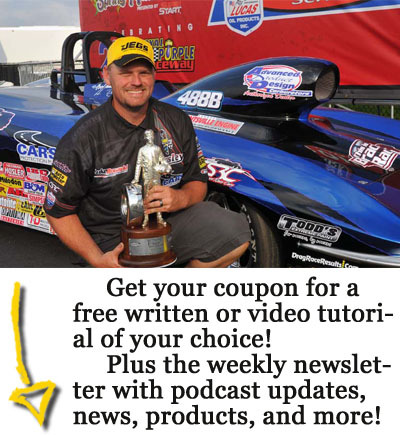 In addition, he tells a few stories about his early years at the track, plus Luke & Jed recap the Fling, the NHRA national event in St. Louis and breakdown their NHRA draft picks at the points battles wind to a close.